Need Cleveland Warehouse Space? Start Searching Early! If you’re in the market for Cleveland warehouse space, a bit of insider advice from third-party logistics experts: Start your search early. Lock in the deal as soon as possible. Recently, The Wall Street Journal reported warehouse space leasing has become increasingly rivalrous as online sales impose evermore unforgiving time crunches on already-squeezed U.S. and Ohio warehouse and distribution centers. Just in the 2018 third quarter, real estate brokerage firm CBREGroup calculated a sharp drop-off in the industrial warehouse vacancies – even though nearly 50 million spare feed of new warehousing capacity hit the market during those three months. The upshot is that as distribution demands rise, Cleveland warehouse space is snapped up almost as fast as it’s built. On the one hand, this is good news because it’s a signal of a robust economy for consumers. However, that’s only part of the story. Bigger picture, it’s the exponential growth of e-commerce and corresponding shift in infrastructure. To further break it down, shoppers turning to the internet for everything from loaves of bread to love seats, many third-party logistics companies and their warehouses are hurdling toward or hovering at capacity. 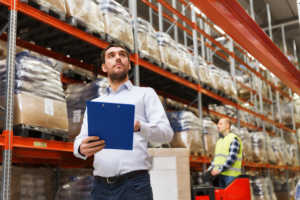 Warehousing is critical because client confidence can be bolstered or broken based on satisfaction with the good condition and timely delivery of products. Cleveland warehouse space shortages can lead to supply chain bottlenecks that can ding consumer satisfaction.